that is like a squashed ball. Boule means ball in French. If you know me, you know I make bread. It has been a lifelong chore. 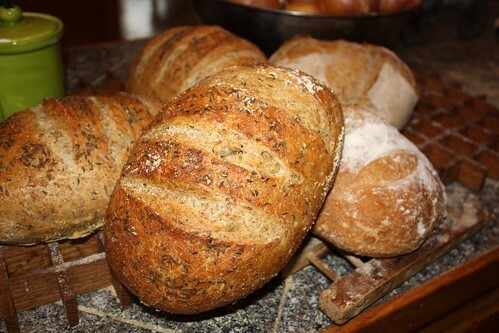 Bread making was never especially enjoyable, but it was necessary — especially for my father. I started by grinding my own wheat when I was about 10 years old and making 8 loaves a week of whole grain bread for the family. (This is why I dislike whole wheat bread now.) The bread making habit stuck and I have continued to make bread all these years. I've done it manually, in bread machines, in antique bread buckets that screw to table tops, and in standing mixers. Lately I have not liked kneading bread because of the damage in my hands from using computers too much. So when I read about the new no-knead artisan breads in the Kind Arthur Flour blog, I immediately tried the new bread making methods. Now, besides our daily bread at home, I make the communion bread from these no-knead recipes. I also made 20 loaves for a luncheon at church for 40 people. However, only 20 people actually came to the luncheon so the unused loaves that I made were sold at $5 a loaf and $81 was sent to the UCC Haiti Relief Fund. An aside: the new bread recipes from Artisan Bread in Five Minutes a Day: The Discovery That Revolutionizes Home Baking allow me to use my huge bread bowl and dough whisk. 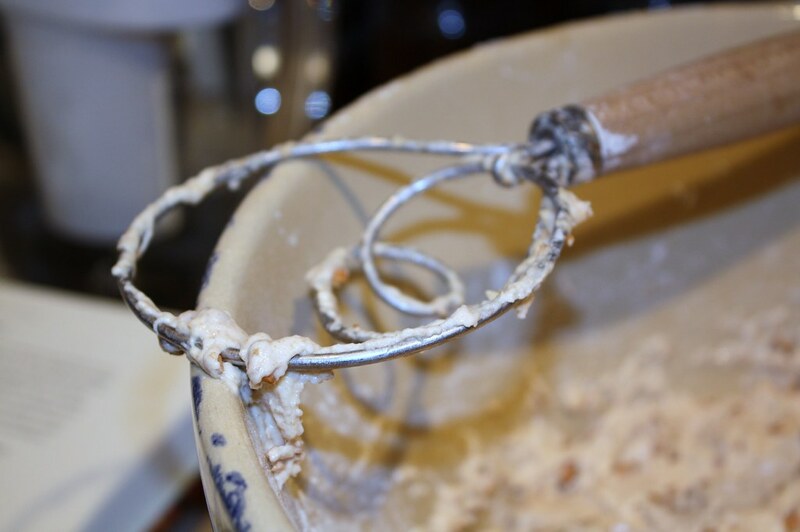 (Buy the dough whisk — it's worth the $15.) I haven't used them for years because I wouldn't knead the bread and I would use bread machines or mixers to knead it. 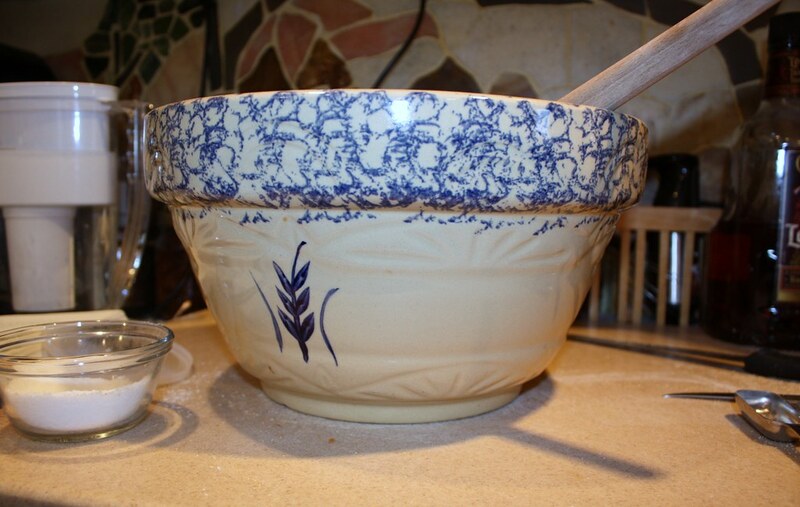 But now I can stir the dough and let it rise in my beautiful bowl. My dough whisk after stirring English Granary bread dough. The no-knead recipes from this book and from recipes from other bakers on the Internet (see also here and here for more) require new ingredients and equipment. Not much, just a bit. I am fortunate that John could make me a baking stone for the oven. It took him five minutes! He also had side less cookie sheets that I use instead of a pizza peel. I seem to require a lot of parchment paper to slide these loaves into the oven, but I'm trying to cut back on that expense. We also bought two food quality plastic containers that each hold 8 quarts to store the dough in the refrigerator. We bought them at Sam's Club. Don't get the bins from King Arthur because you pay three times the price of Sam's Club. The bins cannot be air tight because the yeast gases would make the bin explode. But to store dough in the refrigerator, the dough has to be covered or it will dry out. John solved that problem by heating a thin wire until it was red hot and then pushed it through the lids of the bins (it slipped through the plastic lids like butter). The hole is invisible but is big enough to to let yeast gases escape safely. If I ever want the bins to be air tight, I simply need to plug the tiny hole with a tooth pick. The new ingredients are not required because of the no-knead method. They are required because the recipes are Old World, not American. They are authentic tasting recipes that are way better, I find, than the health food loaves I would make when requested. My creativity is sparked by these recipes and I look forward to creating new tastes and shapes of loaves. The textures of these breads are fascinating and the taste of the loaves is rich. 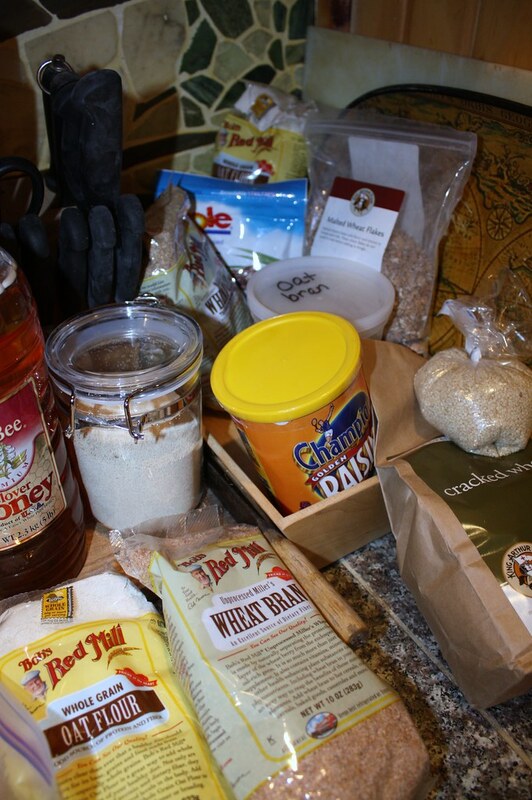 In this photo are oat flour, wheat germ, wheat bran, oat bran, raw seseme seeds, wheat berries, cracked wheat, my yeast jar, raisins, dates, malted wheat flakes and other stuff. Some of these things I get at the Kearsarge Coop but they don't carry a lot of things they should carry, are very expensive and are often grouchy. The grocery stores now carry a lot of this stuff. I only had to go to King Arthur for the malted wheat flakes and the cracked wheat. I also have huge amounts of King Arthur unbleached all-purpose flour, whole wheat flour, white whole wheat flour, rye flour, and corn meal. I should have also gotten malt powder but I forgot. So I am now making my own. I searched the Internet for a malt powder substitute and found that I could make my own malt powder with wheat berries. I happened to have some wheat berries in my bread gear, so I am processing them now for malt powder. Click this link at jugalbandi blog for directions in how to make your own malt powder. 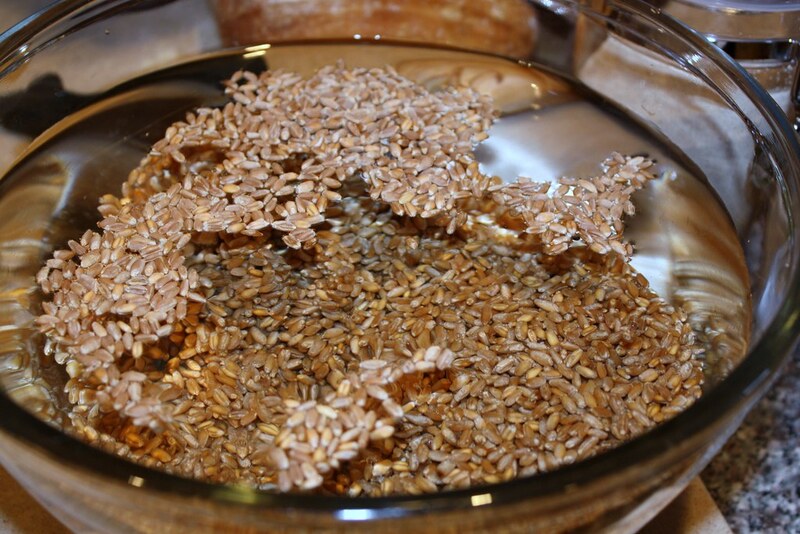 Wheat berries soaking in water for 24 hours. I am not entirely sure why malt powder is used in some of the bread recipes. But it is a sweetener, helps the leavening, and improves the taste, color and texture of the bread (or so I read). According to Wikipedia, "malting is a process applied to cereal grains, in which the grains are made to germinate by soaking in water and are then quickly halted from germinating further by drying/heating with hot air. Thus, malting is a combination of two processes: the sprouting process and the kiln-drying process. These latter terms are often preferred when referring to the field of brewing for batches of beer or other beverages as they provide more specific information." When Anna visited us two weeks ago, I was in the middle of baking for the church luncheon. She went home with about 10 loaves of artisan bread. She prefers whole grain breads but I also sent home a couple of white and light wheat loaves for Aaron. They loved it all! When John and I went to the King Arthur store this weekend, I impulsively bought the second bread book by Hertzberg and Francoise: Healthy Bread in Five Minutes a Day: 100 New Recipes Featuring Whole Grains, Fruits, Vegetables, and Gluten-Free Ingredients. Don't buy impulsively! I paid $27.50 for a book that amazon.com carries for $18.47. I am kicking myself now. Click my links here for either (or both) books and you will be having as much fun as I am baking bread. Hertzog & Francois have a great blog at Artisan Bread in Five Minutes a Day. It has updates, new hints and tricks and corrections. The authors will personally answer any questions that you have and cannot find answers to elsewhere. A final note . . . John is not the biggest fan of these artisan loaves. For him, I still make a wonderful traditional loaf found at http://www.kingarthurflour.com/blog/2010/01/28/sandwich-bread-fit-for-the-king/. Beautiful bread!!!! I love whole grains. How Did You Spend Your Snow Day(s)? Make Your Own Ceiling Cat!